Maya discusses voice care and demonstrates proper techniques for effective voice-over. 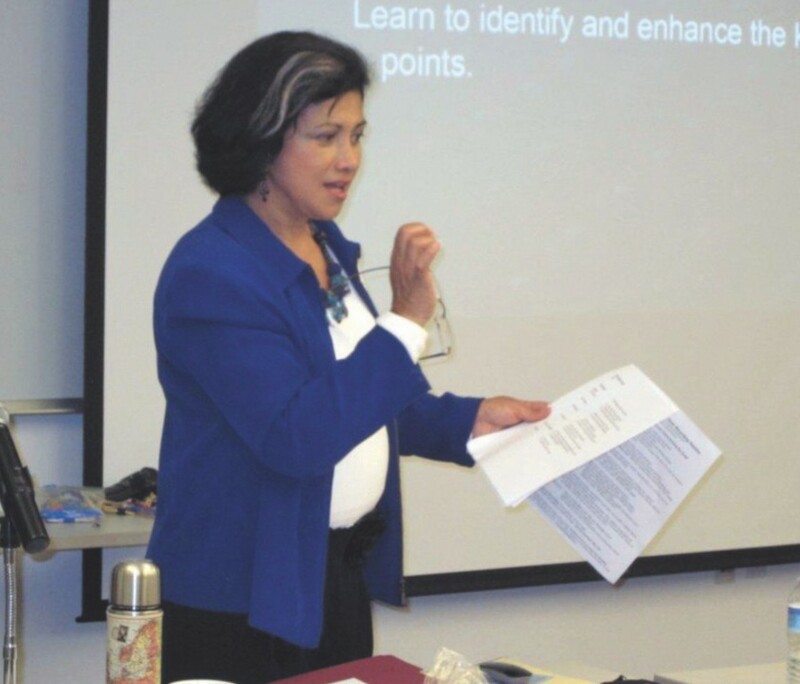 On September 24, 2011, some twenty translators, interpreters, and voice-over talents gathered at the SFSU downtown campus for a lively day-long workshop led by Maya León Meis, entitled Using Your Voice to Make Money. In addition to being a former news anchorwoman and the host of Los Secretos de Maya, her own TV program about healthy living, Peruvian-born Maya León Meis is a premier voice-over professional in the U.S. She is president and CEO of Voice Productions International in Arvada, Colorado, near Denver. Workshop attendees comprised a truly international group hailing from Japan, Taiwan, Peru, Mexico, and Spain, as well as the Bay Area. Students included experienced voice actors looking for fresh ideas as well as those new to the profession. Maya engaged everyone’s interests and needs with clear insights and sound advice. One student from Tokyo wished to improve his voice quality for interpretation work; another from Taipei was interested in acquiring skills for voice localization. Maya explained that while it is difficult for Asian-born speakers of English to lose their native accents entirely, well-modulated Asian-accented English is highly marketable in the U.S.
Maya also identified the growing role of voice acting for medical training videos that provide instruction for patients who need to safely perform procedures at home. Similarly, the Internet’s wide variety of “how-to” videos represents a growing market for skilled voice actors. According to Maya, it is essential for voice talents to comprehend that they form part of a large, multistep production process, and to be good team players. She showed students how to read, parse, and mark a script, identifying key ideas, transitions, and logical places for emphasis and effective delivery. She also discussed proper voice care and a sensible diet for clear vocal delivery and successful recording sessions. Volunteers experienced the challenge of delivering a simple English phrase like “A cheese sandwich for lunch” with clarity, intonation, and meaning. In the playful spirit of the workshop, Maya rewarded their efforts with oversized green $100 bills—play money—to remind voice actors of the job possibilities available to them. With characteristic humor, she highlighted another important benefit: not only can voice acting pay well but it also involves “less brain damage” than the multi-lateral stress of translation or interpretation. The afternoon session focused on more challenging vocal practice, including short advertising scripts for partners. One scripted scenario involved a suspicious spouse intercepting their beloved sneaking into the house after a late-night run to the sandwich shop. Suspicion turns to joy when both discover their shared love for food and savings. Students paired up and gamely worked to bring the characters’ voices to life, often with hilarious results and abundant laughter from the class. kim posted this article under NCTA Events, Voiceover	on Sunday, January 1st, 2012 at 12:08 pm	You can follow any responses to this entry through the RSS 2.0 feed. Both comments and pings are currently closed.